My summer at home is halfway through. School ends in late May and we teacher's aides have June and July off. School begins again August 1 for us and August 5 for the kids. It's been great to be at home, with long stretches of time to myself. I enjoy reading, studying the Bible, crafts, web surfing, learning something new (this summer, bone china history & collectibles), and watching movies. How about you? What are your favorite things to do in the summer? Here are a few offerings that resulted from my enjoyable summer web surfing of late. Challies offers book reviews for grownups, as did Discerning Reader. I say "did" because their last review was in 2013. But what about the kids? Here is one site that reviews of kids' Christian books. Children's book reviews from Redeemed Reader . Speaking of kids, our pastor heartily recommended The Jesus StoryBook Bible by Sally Lloyd-Jones for parents to use with children. One thing this children's Bible does is present Christ in the Old Testament very clearly. Old Testament devotionals are often shall we say, sparse to none or are superficial and trite, so this Bible takes care of that for you in strongly presenting Christ in the Old Testament, and sensitively dealing with other difficult topics. How does one explain the agony in the Garden of Gethsemane? Or the Crucifixion? The Jesus StoryBook Bible does that in a way that helps children understand. The illustrations are fabulous. Here is a Critical Theological Review of Sarah Young's book Jesus Calling by Pastor Jim Osman of Kootenai Community Church. Pr Osman is Justin Peter's pastor and this is the church Peters attends. In an interview I was listening to, Peters recommended Osman's book Spiritual Warfare: Truth or Territory? and I looked it up and found a treasure trove of articles and resources at the church site in addition to the Sarah Young critique. Check it out. A critique of the modern Deliverance Ministry Theology and unbiblical spiritual warfare practices. This series also includes articles describing the nature of true spiritual warfare. We have reached the point in this series where we need to define “spiritual warfare.” Spiritual warfare is the most misunderstood subject in all of modern evangelicalism. When most Christians hear or read the words "spiritual warfare," they envision some sort of mystical hand-to-hand combat that is waged with demons by certain types of prayers, mantras, incantations, or practices such as "binding Satan," "praying a hedge of thorns," exorcisms, or "rebuking demons" in an attempt to take territory from Satan and claim it for Christ. Not only are these specific practices not the least bit biblical, but neither is the notion that spiritual warfare involves direct interaction against demons in order to gain spiritual or physical territory. Proceeds go to Osman's church building project. Eagle eyed readers of the blog might have noticed I added two new blogs to the Christian Blog widget on the right side of the page. Jessica Pickowicz at Beautiful Thing and Carrie [Pseudonym Koens] at Busy Nothings. Enjoy! In 2012 Phil Johnson wrote an excellent piece on being Salt of the Earth for TableTalk magazine. Don't forget what a good resource the online versions of TableTalk are. For those of you, like me, who despair of ever finding current music that's doctrinal and treats Biblical subjects appropriately, here is a new musical group I can recommend. Kings Kaleidoscope is a faith-based alternative band based in Seattle, Washington. As their Wiki says, they style themselves as a band "sporting a variety of influences from math rock and hip-hop to the dense sound of Canadian indie outfit Broken Social Scene". They have released 8 EPs since 2011. You can find them on all the usual places such as Facebook, Twitter, Instagram and also Spotify, iTunes, SoundCloud, Pandora, etc. My favorite songs are Grace Alone, and their How Deep cover. The album graphics are terrific, too. In archaeology news, here is a cool story from Haaretz: Carthage archaeologists dig up smart cooling system for chariot racers ha ha do you see what I did there? "The ancients were madly obsessed by chariot racing 2000 years ago but in the heat of North Africa, the horses would have fainted." So how did they do it? Read to find out! Anyway, Carthage must be destroyed!! In other historical news, I thought these tefillin from the Museum of the Bible twitter stream were pretty. 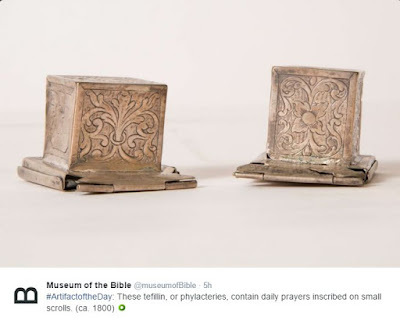 Here is a quickie article from Jewish Virtual Library on what tefillin are. SUPER DUPER! Thanks so much, Pamela!! I had emailed you way back when you did a post about the Rend Collective regarding a band called the citizens (Now officially "citizens and saints") - they were a band that was founded at Mars Hill Church (which, you know, is no longer a church). Kings Kaleidoscope was also a Mars Hill band (I'm sure you know that if you read about them), and since you're open to biblically sound music that originated in a not so sound place - I'd like to again recommend The Citizens to you! Their first album is my favorite - I much prefer the indie rock vibe over the techno-ish stuff, but both albums are good (I just have my fav - look up "Psalm 18 on youtube...it's amazing!). The lyrics are very grounded in rich doctrine and the beats are great, too. (Mars Hill Music Sampler, which is where I think I heard of Citizens, has Kings Kaleidoscope singing "Come Thou Fount" and it's just amazing - you should check the song out if you haven't already!). Also - Sovereign Grace Music is really, really good. And also very biblically sound. We have nearly all their albums (we're not part of a SG church - just appreciate the music), and I especially love "The Ology" which is technically for kids - but it's just too fun and good not to enjoy! Thank you for passing on the recommendation of Sally Lloyd-Jones' book. I have wanted to get a children's Bible book to read to my granddaughter, even though she is only four months old, but the few I've looked at are awful. I just ordered a used copy of this one and can't wait to receive it! As far as picture story bibles go The Jesus Storybook Bible is a great resource, especially for the littles. However, I highly recommend The Child's Story Bible by Catherine F. Vos. It was first published in 1935 and has over 200 engaging stories from the old/New Testament. It's great for ages 4-12 and is a faithful companion to the Bible. It is by far the best children's bible that I have found.